In 1941, the artist Pedro Nel Gómez, followed by the architect Juan Wolff in 1942, floated initiatives to make the Medellin river the center for life and development in Colombia’s second largest city. Nothing much happened until urban planners Carlos Julio Calle and Luis Fernando Arbeláez, working with the architect Marlon Builes submitted a study titled “La evolución de la ciudad como base para su reencuentro con el espacio publico” [The evolution of the city as a base for its reencounter of public spaces] in 1977. Medellín and Colombia would soon have other priorities to deal with, but with those historical chapters of recent decades now solidly in the past, the city has once again looked to its river as a catalyst for urban renewal. Building on the work of several past administrations, that plan has now been set into motion, and construction is underway. 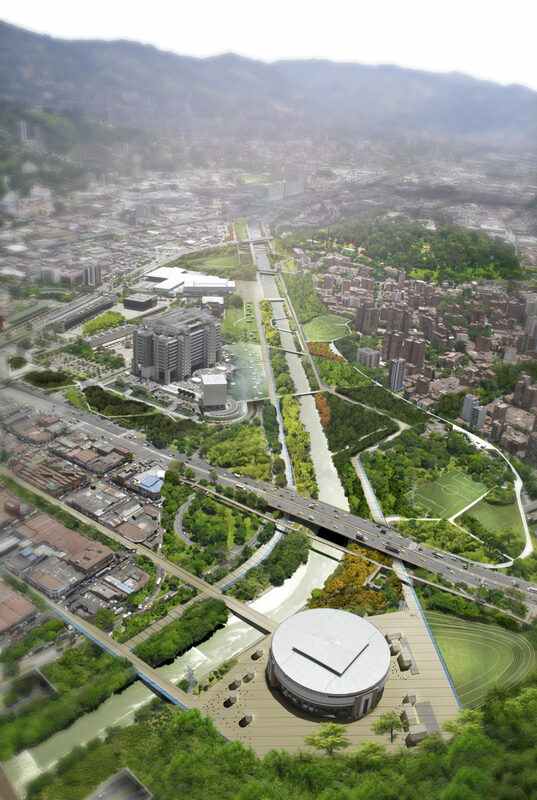 The City of Medellín is undertaking a massive project that will see two major urban arteries submerged underground, surfaced by a city park. The plan includes re-naturalizing the currently channelized river, and remodeling the city’s feeder creek system to take them back to a more pristine, natural state, adding parks, trees and bicycle paths along the way. Finance Colombia was able to meet with Juan Pablo Lopez, the director of Parques del Rio [Parks of the River] for the city of Medellín to learn more about this ambitious public works project, and the impact it is expected to have on the Capital of Colombia’s Antioquia department. Finance Colombia: So tell me about the genesis of the project. Lopez: For some years now a master plan in terms of urban renovation has been gestating but there has never been a public space trigger that can take that to reality for us. 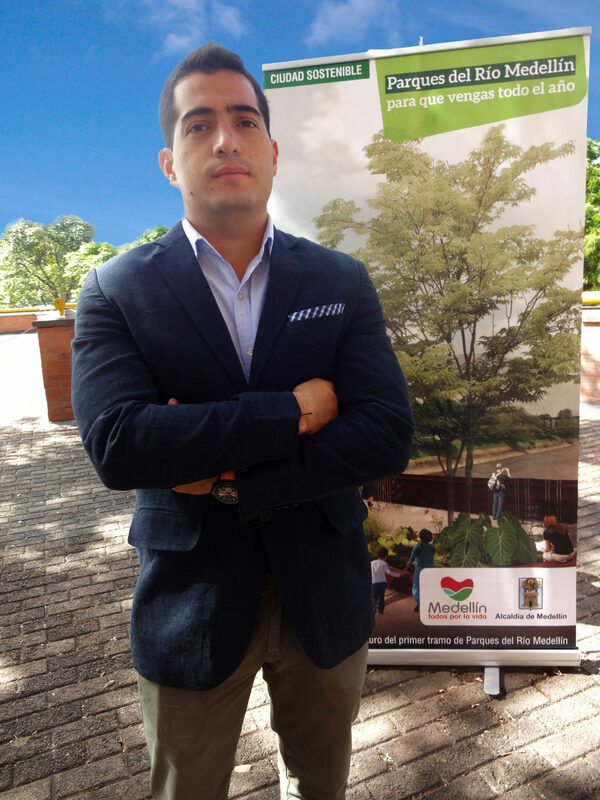 Then the Parques del Rio project comes up, and launching it is something the current mayor, Anibal Gaviria Correa, building upon the work laid down by past administrations, has been able to realize. What will the Parques del Rio consist of? In those strips along the river which are a highway, in some sectors we submerge the highway, that is to say, we take it underground, right? We build some tunnels underneath and then we immediately generate a very interesting public space on the surface. A person who is standing here right now can take a footpath, cross that footbridge to the river and in the river we’re not going to find the highways which are a barrier anymore, but the footpath will continue to a whole park there. And we’re going to cross to the other side that is residential—a person, a pedestrian or a cyclist will be able to take that route without any problems. We’re going to improve mobility for motorists while at the same time generating a very interesting public space. Finance Colombia: A mixed use redevelopment. Lopez: Exactly, then it´s like new housing but with a very interesting mix. Finance Colombia: And like that, when it´s mixed use, the lifestyle is like “I can walk to the shop, I can walk to work, I can walk to the store,” it´s not like you need a car for basic existence. Lopez: Or Castilla, and then they are the ones to spend more (time and money) on commuting. This is where the city´s mobility problems are, and then the city has to fix that error of having grown towards the hillsides. That has turned out to be very expensive because when you grow towards the hillsides then you have to bring infrastructure, you have to bring public transportation, you have to bring all of that up to the hillsides. While if you concentrate the growth along the valley, around where the metro goes, where all the public services are, where the civic center of the city is, then the city becomes much more sustainable. That´s what the project is about. Over there where you see those big machines working, we are going to bury, more or less, 392 meters of the highways. Then we are going to have a park almost as big as four soccer fields lengthwise. We are going to immediately recover 50,000 square meters and we are also going to duplicate the lanes that exist there today, we’re going to improve mobility for motorists while at the same time generating a very interesting public space. Finance Colombia: Then, that is going to be more or less like a central park for everything but it´s not going to impede the traffic, because the traffic will be able to go through underground; and it will also have wider lanes, because that is an area that has also had a lot of traffic jams. Lopez: Right now there are four lanes, and you’re going to have seven lanes, plus merge and exit lanes that will allow—one of the problems that we have isn’t even the flow of traffic across the river but exiting at each one of the bridges. Then, what we’re going to do with those merge lanes is to give traffic a more dynamic flow, that doesn’t have any problems. Finance Colombia: Medellín has an exemplary subway, but during the construction process there were a lot of problems, so how are those going to be avoided with this project? Lopez: At the moment, we have some people directly impacted, from the Conquistadores neighborhood. With those impacted we’re making a plan, creating a citizen’s committee, for that committee to take ownership of the park. They are the ones directly impacted right now but they are going to be the main beneficiaries when it’s built. It’s a citizen committee that takes ownership of the park and that writes something like a coexistence manual, for example, something that happened in the Brooklyn Park (New York City), the one that´s on the East River. I think it´s the community that drives the construction, to turn all of the ancient warehouses—in that case, to be turned into a linear park along the East River. That is what we’re doing right now in some workshops with the Conquistadores community. Finance Colombia: Now that the traffic is diverted, how long will the detours last? How long will the traffic flow be disrupted? Lopez: 11 months since it began, and it began in February. We’re thinking that by January of next year we can be inaugurating the first stage. Finance Colombia: Well here in front of us we have EPM. EPM also has a role in the process, don’t they? Lopez: The new company that is gestating, EPM is the partner with Medellín in that company, which is going to operate, maintain, and is also going to generate those revenues that the Parques del Rio can generate. If you concentrate the growth along the valley, around where the metro goes, where all the public services are, where the civic center of the city is, then the city becomes much more sustainable. That´s what the project is about. Finance Colombia: Talking about the river specifically, one thing that here in Medellín and also in Bogotá—well in Cali too, the rivers in cities are channeled in concrete, and I understand that part of the project is to change the river back to its natural state, with stones and crawdads and fish and all that. Why did they put the rivers like that originally? And what is the plan—what does the plan for the river include, and specifically the river’s natural environment? Lopez: Since the 1950s more or less, there was a worldwide tendency to channelize the rivers that came into being, and that began for heath and sanitation issues mostly. And then the rivers ended up becoming the collectors of all of the city’s dirty waters, then they became harmful to people’s health. I think it was a mistake to have channelized them long ago, and to try to take the channelization away is very complicated, very complex; most of all because the rivers have a flooding behavior. 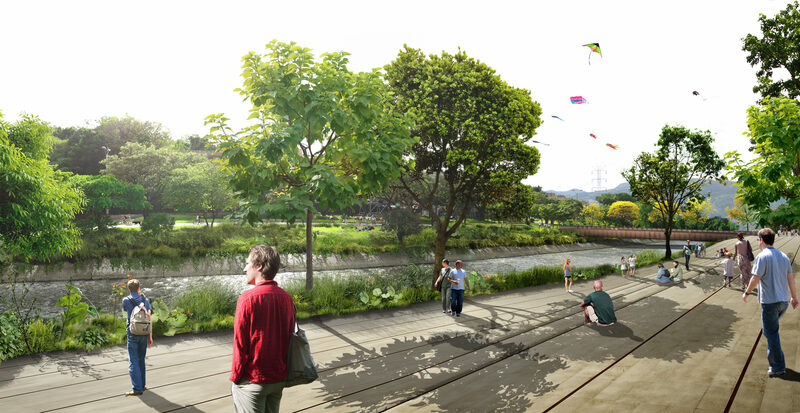 What Parques del Rio is doing is that those cement channels will be enhanced with landscaping and plantings that can provide more interesting ecological benefits. We can plant species that withstand floods and that attract new wildlife, but additionally we have to work with the feeder creeks too, right? Because the creeks are the ones that end up feeding the river, so the Parques del Rio project is also taking place in the creeks, improving their surroundings, and lastly up to the part of the river that isn’t channelized, which is up north. The goal is to protect the watershed such that that no creeks or the river are channelized anymore. Finance Colombia: Is there a treatment plan for the quality of water or anything like that? Lopez: That is done through public companies of Medellín, EPM. They have invested about $1.047 billion dollars in a water treatment plant up north that begins to operate next year, and the whole water collection system of sewage, with all the piping, and then those pipes to collect the sewage, they take it to the treatment plants and it is discharged into the river only after it is treated, not how it’s being done right now, where the sewage is poured directly into the river. Finance Colombia: And the Jardin Cincunvalar (Surrounding Garden) is part of this integrated project; it’s all part of a big plan, isn’t it? Lopez: Yes, all of that is part of the big plan for the city in terms of sustainability and urban planning. With Parques del Rio, we attract people to here to the center, but with the Green Belt and the linear parks along the feeder creeks, we get all that ecological connectivity the city needs. It is a whole network that is woven with the river, the creeks upward, and the Jardin Circunvalar, or the Green Belt, protecting all of this. Finance Colombia: And what is the whole term of the plan? Is it a five or ten year plan in total? Lopez: The idea is that it is ten years of construction and then 25 years of operation planning. With this whole plan, the city is looking to raise the key metric of square meters of public space per inhabitant. At the moment we have just 3.9 square meters per inhabitant, the idea is to take that to 7.5.